Dr. Aalam and Dr. Krivitsky understand that periodontal health should be achieved with efficient, minimally invasive, and cost-effective ways, to best benefit each patient. Therefore, at the CENTER for Advanced Periodontal & Implant Therapy, we offer a wide range of non-surgical procedures to help patients achieve optimal periodontal health. Contact our Brentwood office to schedule an appointment with our trusted periodontists and what the best course of action for your case is. Scaling and root planning is the processes of removing the buildup of plaque and tartar from the teeth and roots. 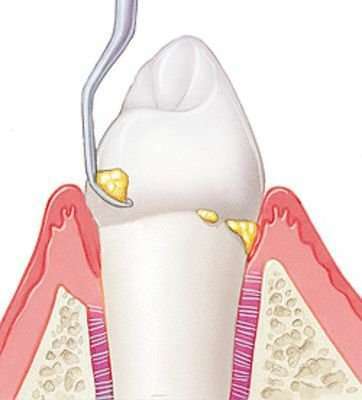 The area is numbed and the periodontist will access the root surface to remove plaque, bacterial toxins, and tartar. Root planning then smooths the rough patches on the roots’ surfaces to prevent future bacteria and plaque accumulation below the gumline, enabling gums to properly heal and reattach to the tooth. In the case where non-surgical therapy does not resolve in sufficient pocket depth reduction, further surgical pocket reduction may be necessary. In these cases, your experienced Brentwood Periodontists will assess your needs and determine the best course of treatment for you. Following the non-surgical procedure, Dr. Aalam and Dr. Krivitsky may also perform additional therapy to further treat the infections, including treatment with antimicrobial medicine or systematic antibiotics. The primary purpose of nonsurgical periodontal rehabilitation is to treat periodontal disease, by carefully removing bacteria and other toxins from under the gums and root surfaces. Healthy gum tissue should securely fit around each tooth. However, in the case of periodontal disease, bacteria from plaque buildup can spread underneath the gums, damaging the gum tissue and causing pockets to form between the tissue and the tooth. If you display signs of aggressive gum disease, including severe bacteria and tartar buildup and formation of deep pockets, scaling and root planning is most likely the first procedure your dental care provider will use as part of the initial therapy. The goal of Dr. Aalam and Dr. Krivitsky is to resolve patients’ periodontal issues through non-surgical regenerative therapies, to avoid the need for additional treatment or surgery down the line. At the CENTER for Advanced Periodontal & Implant Therapy, we aim to heal patients through thorough and individualized care, so patients can maintain optimal oral health through at home care and routine visits to their periodontist. What if Scaling & Root planing don’t work? If you have advanced periodontal disease, your gum tissue may not respond to non-surgical treatments. In extreme cases, not even good oral hygiene and maintenance is enough. In such situations, and after all non-surgical options have been considered, Periodontists Dr. Aalam and Dr. Krivitsky in Los Angeles may take a surgical approach to address the issue. In this procedure, Brentwood periodontists Dr. Krivitsky and Dr. Aalam make tiny incisions in your gum so that a section of gum tissue can be folded back, exposing the roots to remove the disease-causing bacteria and to re-contour the disease-affected irregular bone. Once the pocket surgery procedure is done, the gum tissue is sutured back into place for reattachment to healthy bone. This is done as a treatment for gum disease to facilitate oral hygiene and to prevent further bone loss. The dental bone graft procedure is performed when periodontal disease has destroyed the bone surrounding the root of your tooth. The graft may be composed of small fragments of your own bone, synthetic material, or donated material. The bone graft helps prevent tooth loss by holding your tooth in place. Sometimes teeth appear short when they are actually the proper lengths, but are covered with too much gum tissue. This can be corrected with a dental crown lengthening procedure. In this procedure, excess gum and bone tissue are reshaped to expose more of the natural tooth. Crown lengthening may also be used to expose a part of the tooth that needs to be restored, or for gummy smile correction. If you are suffering from periodontal disease, schedule a consultation with Los Angeles periodontists Dr. Aalam or Dr. Krivitsky today!